The Maximilianpark was the location for the first Regional Garden Show in North Rhine-Westphalia in 1984. Wild meadows and areas of woodland form a contrast to the display areas of roses, perennials and shrubs. This dichotomy can also be found in the relationship between the buildings and landscape. The greened ecological building contrasts sharply with the section of the former coal washing plant boldly reconceived as an elephant by the artist Dr. Horst Rellecke. The paths in the park run through various themed gardens, pass by seasonally changing plantings and through rugged woodland, continue past an area of semi-natural ponds and marshland and finally arrive at the lake terraces of the Maximiliansee with its fountains. Many objets d’art enhance the park today. Themed playgrounds have been built for children while water can be experienced in its many different forms. Tropical butterflies fly through the air in the largest butterfly house in North Rhine-Westphalia. The latest highlights in the park are plantings of perennials and grasses by garden architect Piet Oudolf. These invite the visitor to enjoy floral excursions through a sea of impressive plant compositions. Ecological issues and planning objectives were weighed up carefully against each other during the transformation of the former colliery grounds for the Regional Garden Show. In accordance with the planners’ central concern, the revitalisation process which had already been begun by nature on the previously derelict colliery grounds was respected. Most of the themes in the landscaped areas of the garden thus found their counterpoints in the already existing situation: the display areas of roses, perennials, grasses and shrubs form a contrast to the wild areas. This contrast is likewise evident in the landscaping of the terrain, the artificial Maximiliansee being created as a natural pond with small biotopes in the east part of the park while an area of water with plenty of opportunities for leisure activities was created in the west. The concept of creating more strongly landscaped areas in the west of the park and leaving unchanged the extensive undisturbed areas with pioneering forests and flood-plain forests in the east remains in place to this day. The mining history of the terrain also found its way into the park’s new design. Fragmentary ruins of the former mine were integrated into the landscape and, in some cases, given a new architectural twist, as is shown impressively by the glass elephant created from the former coal washing plant according to plans drawn up by artist and architect Dr. Horst Rellecke. A scented garden awaits the visitor behind a tall hedge of eastern arborvitae beside the main entrance. Framed by low hedges of lavender and wall germander, it expressly invites visitors to “rub and smell” the scented plants. Various scented rambling roses climb up a pergola structure. Gardens to the east of the main path are dedicated to various themes. The vegetable and herb garden can be found here. At its centre is a raised herb bed surrounded by vegetable patches with old and new types of vegetable as well as berry bushes. The apothecary garden on the other side of the path informs visitors about various medicinal plants and their properties. Plants for dyeing with natural dyes grow in the neighbouring dye garden. The fuchsia garden where various types of fuchsia are cultivated can be found at the edge of the wood. A raised path with idyllic spots for sitting runs along above the broken edge of the slag heap and provides a view of the natural pond. The semi-natural lake below covers an area of approximately 2,800 m2 and has extensive flood zones, its water level changing in accordance with natural influences. The lake is composed of various biotopes – stretches of water, shore plants in small inlets, pools and islands. Birds, insects and amphibians find places to live here. The jetty, viewing tower and platform at the south end of the lake provides good opportunities for observing wildlife. Fountains in the park enable visitors to experience water. The roses and perennials unfold their profusion of blossoms on the south slope opposite the butterfly house from June to October. 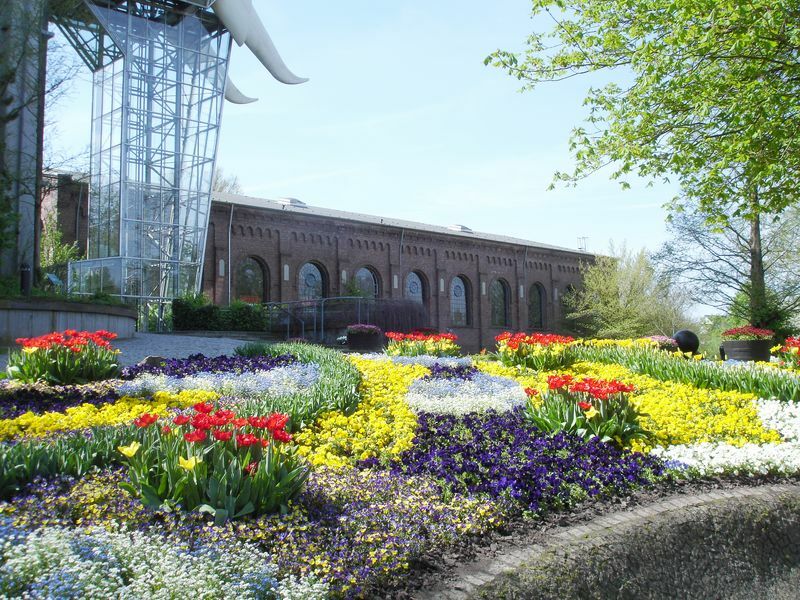 Large flowerbeds planted according to the seasons provide new touches in the park every year. Covering an area of almost 1,500 sqm, constantly new combinations of spring and summer flowers surprise visitors with their wealth and diversity. Playful use is made of pictures composed of plants, and colours are used to charm visitors. Thus the park is covered with masses of flowering bulbs in spring: more than 100,000 daffodils blossom in the lawns and meadows while thousands of variously-coloured tulips, hyacinths, scilla siberica and crown imperials flower brightly in the flowerbeds. The park has been further enhanced since July 2011 by two plantings of perennials and grasses by garden architect Piet Oudolf. Curving paths thread their way through Piet Oudolf’s compositions of plants, which continue today to invite visitors on floral excursions through a sea of impressive perennial and grass formations. In the Maximilianpark great importance is accorded to the visual arts alongside nature, culture, fun and games. The “Park-Raum”, which is open to the public, surprises visitors in many places with a wide variety of objets d’art. April – September: 09.00 – 21.00. Last entry 19.00. October – March: 10.00 – 19.00 Uhr. Last entry 17.00. Green classroom; Markus Maul: maul@maximilianpark.de. 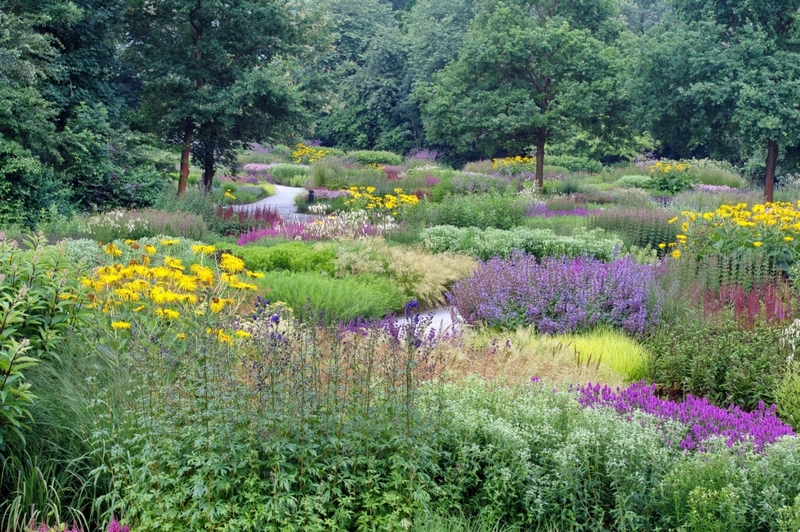 Bedding schemes on Piet Oudolf’s garden, please contact Tel: 02381-98210-0.